Ferdinand Spoor, founder of one of several pits working under the name of Coppy Crooks Colliery near Shildon County Durham. He was born at Newcastle upon Tyne in 1825, to Thomas Spoor and Dorothy Hutchinson. The lady with him is Annie Taylorson Scarth of Houghton-le-Spring, whom he married at Newcastle on February 2, 1850. A year later the newly-wed couple are recorded at Escomb with their first child, Thomas Jackson Spoor, born there in that year. Ferdinand is stated as being a grocer, which he is a decade later, but also in the possession of 30 acres of land. 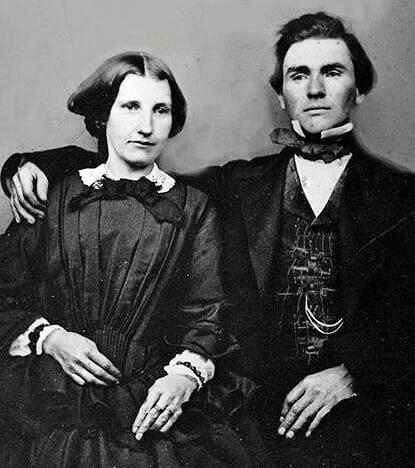 In March 1866 Annie, Ferdinand’s wife of 16 years, passes away at the age of forty. Four years later in September 1870, Ferdinand marries Laura Nichol of Penryn, Cornwall. In 1881 he is classed as a retired grocer at age 53 and by 1891 his occupation is that of colliery owner. He would end his days at Woodside near Escomb in 1894 aged 67. Second wife Laura would answer unto God at Wandsworth, London, in 1910 aged 78. Records reveal that Ferdinand and his brother Benjamin went to the progressive town of Witton Park from Walker near Newcastle when they were young men, and in their lives played a commanding part in the Bishop Auckland Primitive Methodist Circuit and beyond. Brother Benjamin is noted as being one of the founders of Primitive Methodism at Witton Park. Ferdinand was steward of the Auckland Primitive Methodist Circuit, from 1871 to his death in 1894. Can you supply a reference, please, for the newspaper text.